Crochet keeps a large number of different surprises. 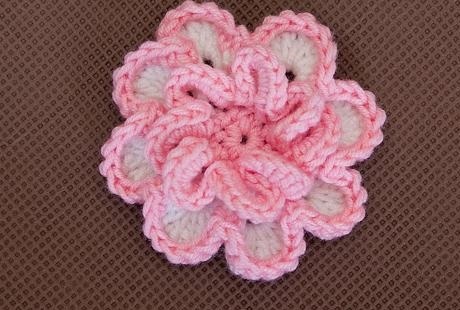 And one of them is the ability to link crochet flowers. And it can be done as your own decorations for the interior, and make for clothes decorating, sumochek, purses and other elements of women's wardrobe. 1p. We engaged in a loop 8 columns without sc(st b / n), in the end of the series carry polustolbik and tighten the mobile loop. 2p. 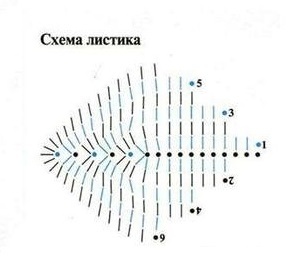 In the very first loop of the previous row provyazyvaem *1 st b / n, and lift out of it 7 stitches(pp), then do the following loop 1 Article w / n. * Knitting repeat to end of row from * to *, vyvyazyvaya more 6 petals. 3p. To get involved in each lobe of the arc 9 st b / n. At the end of a number of perform 1 polustolbik. 4p. Take the white thread and make it a loop, which is fixed in the loop of the second row, already linked pink flowers, and doing art w /, then lift * 7 aerial loops in the same loop to get involved 1 st b / n, then provyazyvaem item b / n in the next loop of the number of *. Knitting continue in the same manner, until a total of 8 white petals. 5p. In each petal to get involved: st b / n, polustolbik, 2 column with sc(v s / n), 1 Article with two sc(v 2 / n), 2 v s / n, a connecting bar with nakida,1 st b / n. At the end of a series of make the connection bar. With the help of a hook, you can create and present a small miracle in the form of pots with flowers. This creation can become not only a wonderful decoration and complement any decor, but also a great gift for any woman. Learn to knit crochet flower is not so difficult. 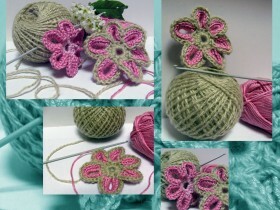 Here are some examples, where diagrams crochet flowers, as well as video. 1.We make a pot. Operation starts brown or gray yarn in the ring, vyvyazannogo five loops. At the beginning of each row do 3 lifting loop, and at the end of the coupling bar. 1p. Provyazyvaem in ring 11 v s / n.
2p. In the first loop provyazyvaem 1 v s / n, and following on 2 v s / n.
3-4p. We start with 2 v s / n. in first loop, then alternate 1 v s / n. in the next st, 2 v s / n. one of a number of loop. 5-16 row. Provyazyvaem PT / NV series of each loop. After that we will be ready to pot. 2. 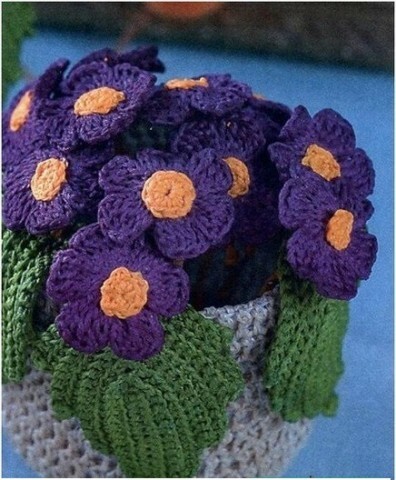 Knit flowers. For flowers take purple yarn and make a circle of 6 loops. 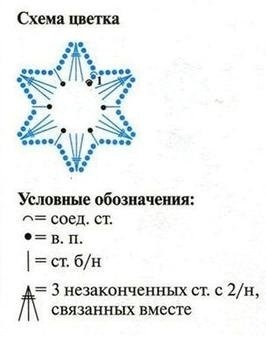 then knit 6 pp, and do 3 v 2 / n, not provyazyvaya them to the end, with the result that the hook is obtained 6 petelek, which together provyazyvaem, again 5 pp. Then 4 times repeat sequence: 1 v s / n., 5 pp, 3 v 2 / n, not knit to the end and connected together, 5pp. Then we take the yarn and begin to yellow to crochet midway colors. For this purpose, the ring of the three loops to get involved 10 st b / n and fasten thread work, leaving a fairly long its end. Such elements of violet and yellow yarn is necessary to prepare for the future product of 12 stuff. 1p. The third loop chains to get involved 1 st b / n, 9 st b / n in each loop of the previous row, then execute 2v.p., 8st b / n.
2r.petlya lift, 7st b / n, 2 Article w / n for the arc of the two aerial loops of the previous row,2 pp, then tighter arc 2nd Class w /, 8 st b / n.
These leaves to the pot with primulas need to prepare 7 pcs. 4. We make stems for flowers. Each stalk must be cut by 12 cm wire, then carefully pasted over it and attach double-sided tape on top of the middle of a flower, left thread winding wire in a circle. Once all items are linked by their need to wash and starch, and then assembled into a finished product. 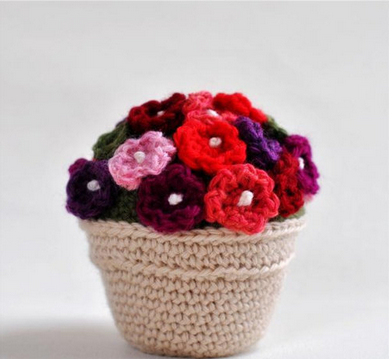 To do this, knitted pot can be put on a plastic bucket and secure it with glue, and all other elements are also connected to each other via a needle and superglue. Instead of flowers primrose can be linked, such as violets.